i am using 5630/5730 led and i checked the dimension of the led. but i didn’t find any footprint matching with the led i mentioned. If you ask for help finding a footprint (or symbol) of a component then it is customary to add a link to its datasheet. Thank you for providing the footprint. but looks like dimension of the led i have is bit different. My link were shoots in the dark… as @Rene_Poschl suggested, you need to post a link to the full datasheet… a draw of pins is not enough to design a correct fp with proper pads. When come to LED now a day, I noted that their footprint aren’t follow any old style/standard … so most likely it require one create customize for it. This is of course only an option for parts that are covered by this standard. The standard does cover two terminal LEDs as long as they do not need special thermal considerations. I posted those models some time ago to my github… must be in some thread with my name as well, just use search. Footprints are not KiCAD conform, but maybe they get you started? Oh and yeah, be very careful with the marker and what it stands for. 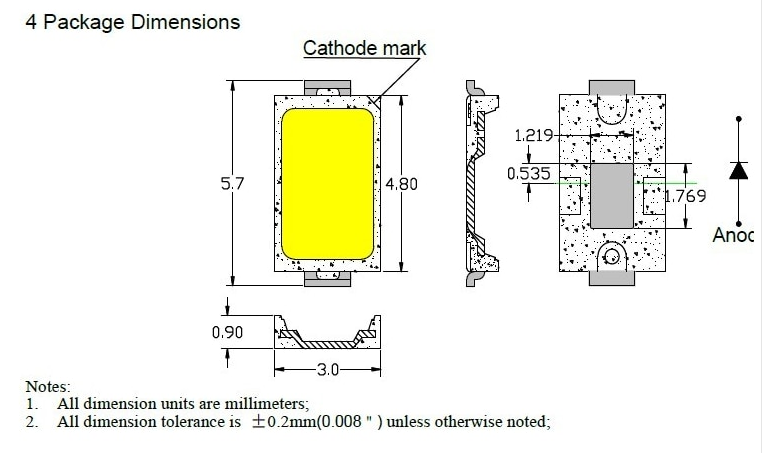 Some it’s anode, others its cathode. This remind me that customize mapping symbol to footprint is needed between the symbol and footprint when numbering naming scheme are used. But it will be much more natural if pads/pins naming in the footprint/symbol are A and C instead of numbers!